The Grand Place is also known as Grote Markt on some maps. You’ll find year round activities here too with various festivals and seasonal displays. One of these events sees the cobbled floor transformed into a carpet of flowers! The old town hall is the building that really stands out, but all of the others are worth seeing too including the guildhalls and ‘breadhouse’. The Town Hall, which has an imposing gothic tower, dates back to 1402 although construction wasn’t completed until 1455. Make sure you come back at night to see the lights of the square too. 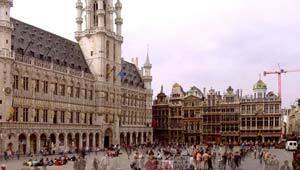 The Grand Place is also considered such a treasure of history that it has been designated a World Heritage Site. The Grand Place is in the middle of Brussels city centre. Streets leading to it include Rue de la Colline, Rue Charles Buls, Rue Chair et Pain & Rue des Harengs. Nearest Metro stop is Bruxelles Central/Brussel-Centraal but if you’re in the city centre anyway, just follow the crowds!